When I woke up this morning, I did not expect the day to include a meeting with a man who ran the 4 x 100 relay with Thurman Thomas at the Missouri City Junior High School. But it was that kind of day. Our agenda today included a trip to the Fiesta Bowl Ticket Office so that four members of our family could exchange their tickets. 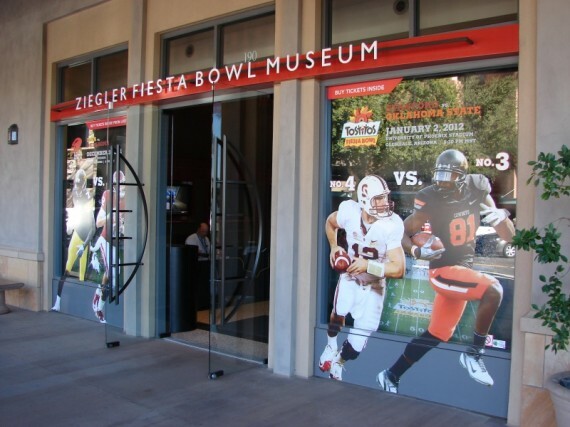 The ticket office is handily located within the Fiesta Bowl Museum in downtown Scottsdale. 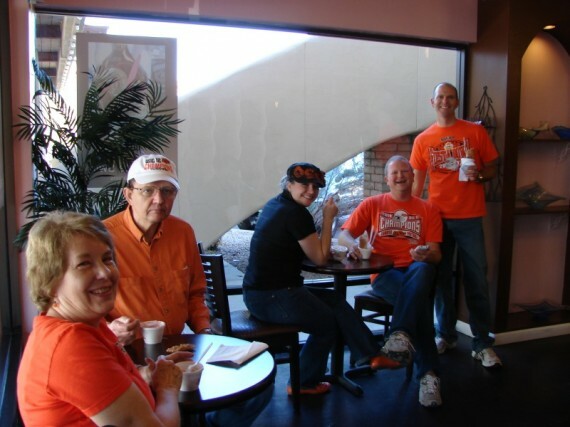 Scott, Erin, Joe & Judy visited Scottsdale yesterday, so they were our official tour guides. On our way to Scottsdale, there was a lot of conversation in our vehicles about the cell phone towers disguised as palm trees. We passed several of these, and Stephanie was explaining to Marissa where to look when Marissa interrupted her and asked, “What’s a cell tower?” I guess you need to know your audience. 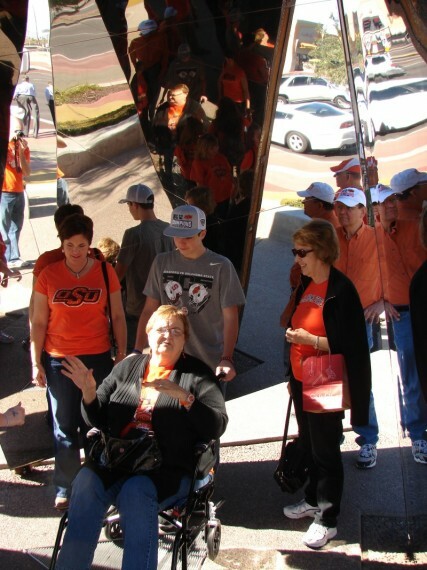 We arrived at the Fiesta Bowl Museum around 11 am and our crew was able to quickly exchange their tickets. PK is not getting around too well this week, so she exchanged her ticket for a handicapped accessible seat. KK, Joe & Judy were able to also exchange their tickets so they can sit with her. 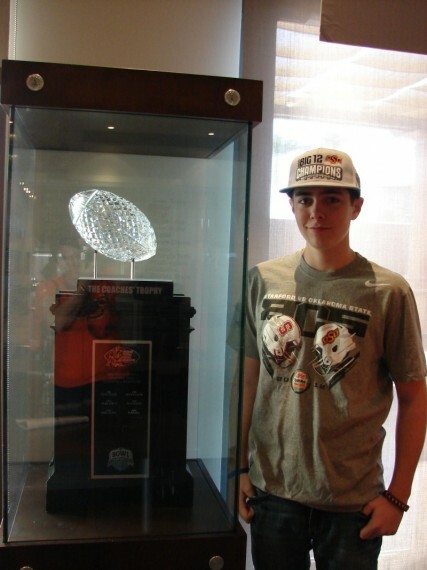 Miles was attracted to the National Championship Trophy at the Museum. Following the museum, we went off on a search for lunch. Unfortunately, we walked past a kitchen gadget store called Sur la table. Our group spent a LONG time in here and only with exercising the utmost restraint, did we leave without our hands full of bags. In the end, we escaped with a cookie cutter in the shape of a chicken, and an onion holder in the shape of an onion. I will consider that a win. 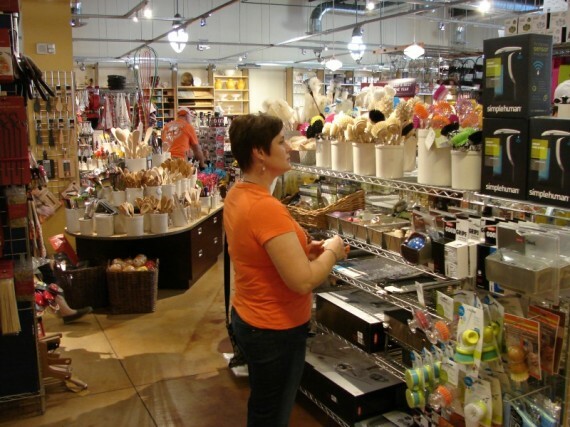 Stephanie scoping out the bargains at Sur la table. We got word of a local place with good, inexpensive Mexican food and headed that way. Before we got there, we encountered a piece of public artwork at the corner of Scottsale and Camelback roads, called The Doors. It was designed to give you the feeling of being inside a kaleidoscope. I can’t vouch for that, but our group did have to check it out. A short walk past the W hotel later, we found our destination: Julio’s Too. This place was a little off the beaten path, and wasn’t busy, but the food was well priced, plentiful and tasty. We took advantage of the pleasant Scottsdale weather and sat in the outdoor patio. Placing our order at Julio's Too. If you visit, try the spinach queso covered burrito. Both Stephanie and I got it (with different meats), and it was outstanding. After lunch, we waddled back to the shopping district and found the Nordstrom. It’s always fun to do a little window shopping at an upscale store like this. 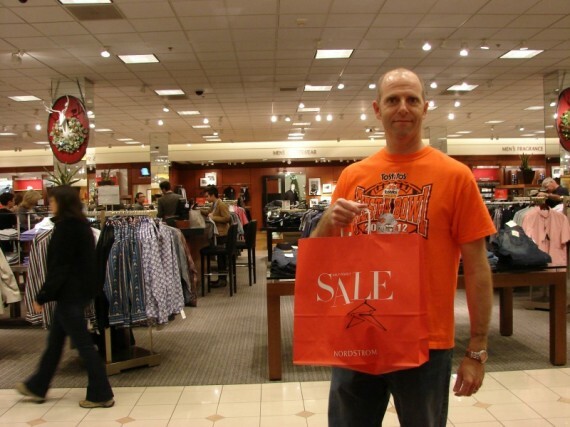 If you are concerned about the economy, just visit a Nordstrom and you will see plenty of people with a ridiculous amount of disposable income. I could fit 300 watches in this bag, but I only bought one. Following that shopping spree, we went for a walk back to our cars and wound up at Lee’s Cream Liqueur. This ice cream shop provides fresh ice cream blended with premium liqueurs. Scott & Erin staked this place out yesterday, and we were the benefactors today. Special thanks to KK & PK for picking up the tab! Enjoying ice cream: Judy, Joe, Erin, Scott and myself. I enjoyed the Black Russian Kahlua and Stephanie ordered the White Russian Kahlua. 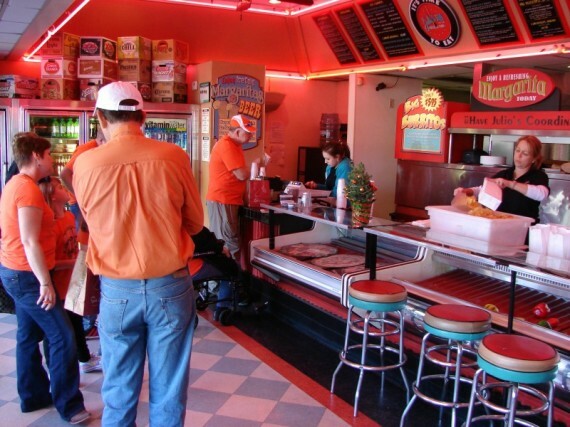 While we were there, a group of about 20 showed up, and it turns out they were part of a food tour. We asked them about it, and they were visiting 5 eateries. It sounded like a lot of fun, and if I didn’t have 5 in my party, I might consider the $42 price tag per person. Our next stop was Tempe. Scott specifically, and the rest of us generally, wanted to check out Sun Devil Stadium and the Arizona State campus. 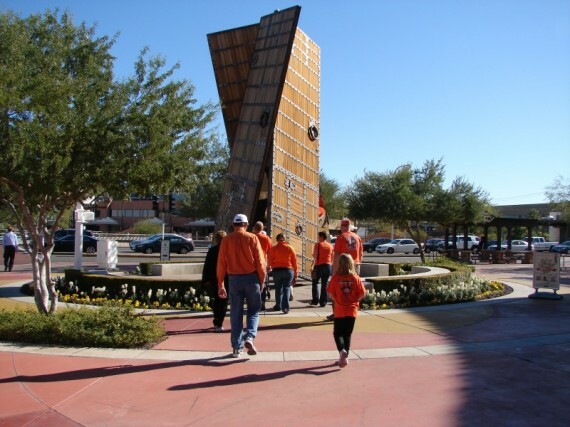 We arrived about 5 hours before the Insight Bowl was set to begin in the stadium and you would never know it, other than a few tailgaters that were already out. 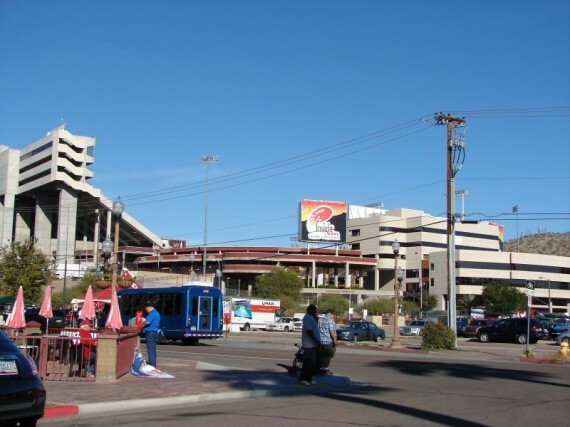 An afternoon shot of Sun Devil Stadium. While waiting at a stop sign, a man holding an “I Need Tickets” sign approached us, and the first words out of his mouth were, “Where is Thurman Thomas?” That is kind of an odd question, and I’m not even sure we responded. He continued on to tell us that he ran track with Thurman at Missouri City Junior High in Missouri City, Texas. Any Oklahoma State fan worth his salt knows Thurman hailed from Missouri City, so I assume he is legit. Former track teammate of Thurman Thomas! This fellow, whose name we didn’t catch, went on to say that the other three guys on the relay team were Thurman, the fastest white guy he’d ever seen (nicknamed “White Lightning”), and a fellow that went on to play at Texas. As a matter of fact, White Lightning played at Baylor. 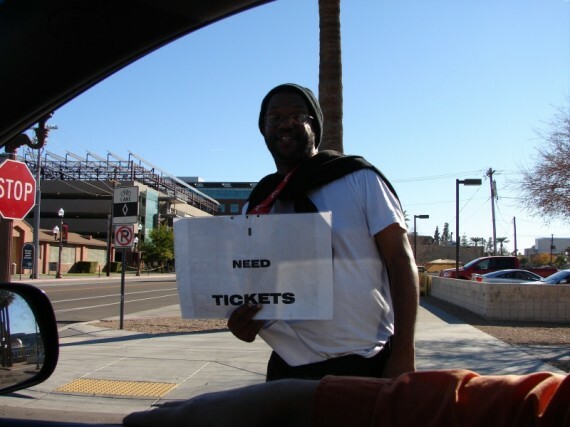 I’m sure it all seems a little depressing to the guy trying to hawk us Insight Bowl tickets on a side street in Tempe, Arizona. He was very friendly, and he not only talked our ears off, he stopped the other vehicle in our group and gave them the same spiel. Best of luck to him! As we left our new friend, we pulled over to regroup, and KK got out of his truck and walked over to a tent selling Oklahoma University gear. (OU is playing in the Insight Bowl this evening.) That in itself is enough to make you shake your head if you know my Dad. Minutes later, he was walking back to our vehicles carrying an OU balloon! It was all good, though. 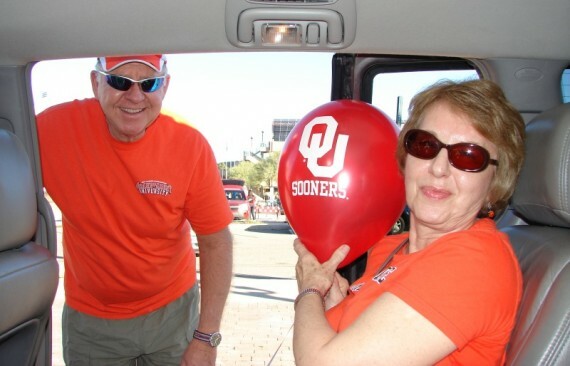 He had brought the balloon to Judy, who is the token OU fan in our family. We love you, Judy! KK presents Judy with an OU balloon. We told Judy that this was the first OU item that had ever been allowed in our van, but we are glad to make an exception for her. Our last stop of the day was Cabela’s. PK and KK had promised some moccasins to Mallory for her birthday and this was the place to shop. We spent an incredible amount of time in the store looking at shoes. It turns out that not only did Mallory get her moccasins, but Scott got a fresh new pair of orange kicks, KK got a pair of hiking boots, and Joe bought some fudge. 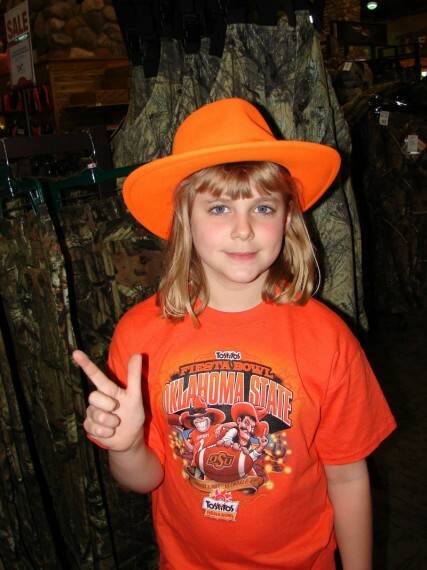 Marissa found a $50 orange hat. We didn't buy it, but we did take her picture in it. Pistol's Firing! The Cabela’s is located in Glendale, in the shadow of the University of Phoenix Stadium, where the Fiesta Bowl will be played in a few days. We made a point of driving through the small entertainment district nearby, and then driving around the stadium. We made it back to the vacation home at a pleasantly early time. 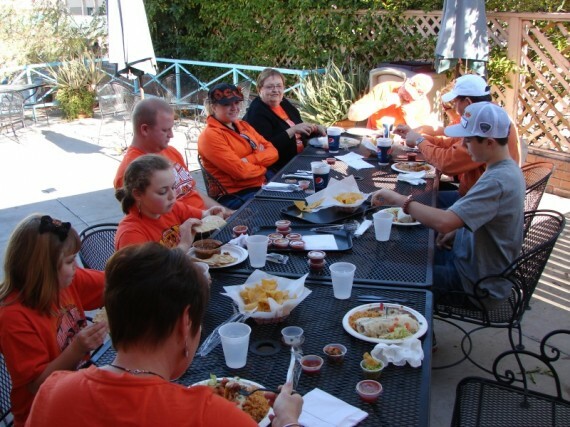 The evening was spent eating dinner, watching football, planning tomorrow’s Fiesta Bowl Parade activities, and distracting the blogger. Special Thanks to my brother, Scott, for his continuous Thurston Howell the Third impressions while I was documenting our activities today. Could you point me in the direction of the smoking room? I do enjoy a good puff. Even though I may not have showed my appreciation at the time, you are full of awesomeness. Glad we’re spending the week together! Thanks for sharing. Looks like you guys are having fun. I’m turning a bit green with envy (like when you went to the College World Series..back when we were roomies & I couldn’t go bc I had to work) LOL! Wish we were there too but will just have to live vicariously through you for this one. Can’t wait to see some more…. Thanks for sharing. I really enjoy ” keeping up with the Kings”! Tell KK that Bismarck is having fun but will be coming home soon.